Gabe Alexander collapsed into his hammock. Exhausted from a 15-mile march on day 3 of a 5-day backpacking trip with his father, the 16-year-old from Athens, Ohio, fell asleep within minutes. Three hours later, he was pulled from the hammock by his head. Gabe Alexander was wrong. It was indeed a black bear that had attacked him, not far from the Appalachian Trail in Great Smoky Mountains National Park. And here’s the thing: He and his father had done everything right. They had secured their food and trash in plastic bags on the bear wires hanging high above their campsite. They’d eaten all their food at supper, then rinsed the dishes in a nearby stream. They had no soap or food on them when the bear attacked Gabe. Gabe’s father Greg had awakened to his son’s screams. Greg bandaged Gabe’s head and had him hold a shirt to keep his torn lip from flapping loose while the two hiked five miles to a campground, which they reached around 2 a.m. A group with a motorboat then took the two across Fontana Lake, and Gabe was helicoptered to a hospital in Asheville. Greg Alexander was left to make the drive from Fontana Lake. Imagine his thoughts on that drive. Nearly a year later, Gabe Alexander still wears visible scars left from the attack. Otherwise, he’s much the same person he was before the fateful backpacking trip. “People keep talking to me and expecting it to be profound or life-changing or damaging, but I don’t feel I’ve been affected or changed by it other than that I’ve got a few scars and a good story,” Gabe says. Most people who have spent any time outdoors in Appalachia have some kind of bear story, though not near as dramatic as what happened to the Alexanders. I’ve bumped into black bear a dozen times or so, mostly in the Smokies during annual family trips growing up, but also within the past year on our farm in Floyd County, Virginia. When our preschooler struggles to sit still at the dinner table, one remedy that almost always works is telling him a bear story, even if it’s just the one about the cub running through our campsite and just inches beneath my brother, hanging upside-down from a tree. Perhaps my oldest memory involves a bear: In a wooded site at Cranberry Lake campground in upstate New York, I was inside a tent with my parents, alert as the sound of a big nose sniffing moved around its perimeter. Later, I watched from inside the cab of a pickup truck while my dad tried, with some difficulty, to remove the bear from our campsite. It’s been 35 years since that happened, and that time has left my memory foggy and unreliable. I remember my dad fighting the bear with a stick as it stood up on its hind legs. My mom says it never stood up and he didn’t fight it so much as try to shoo it away. All the same, the strength of that faded memory demonstrates the power of the bear. Our culture is filled with representations of bears—both friendly bears like Yogi Bear and Smokey Bear, or Bill Murray voicing Baloo in the “Jungle Book” remake, but also bears as symbol of nature’s ferocity, as depicted in 2015’s Oscar-nominated “The Revenant.” These views of bears ultimately have less to do with actual bear behavior than they do our human tendency to anthropomorphize animals and project our own hopes and fears onto nature. And at a time when human interaction with megafauna feels like it’s on the decline, people are increasingly encountering bears due to encroaching suburbanization and the creation of more “edge” habitat—where the woods meet open areas like fields and lawns—which is more favorable for bear food sources. The late spring marks the time when bears emerge from hibernation, diminished and hungry after months in the den. This is when bear/human interactions are most likely, as bears target bird feeders and trash bins in search of easy food. Gabe Alexander was attacked on the first weekend in June by what his father is sure was a predatory bear. As Gabe recovered in the hospital, news reports of the attack drove a flurry of social media activity, as self-appointed experts declared there was no such thing as a predatory bear and that the Alexanders must have done something to prompt the incident. The Alexanders’ assertion, however, is backed up by Bill Stiver, who has worked with bears in Great Smoky Mountains National Park for 25 years, including five as its supervisory wildlife biologist. This year, that potential may be higher than usual. That situation adds new urgency to the park’s standard advice to take good care of their food and garbage. That extends beyond the Smokies’ visitors to its neighbors, and really to anyone in bear country. Take down bird feeders no later than April 1, and secure trash. 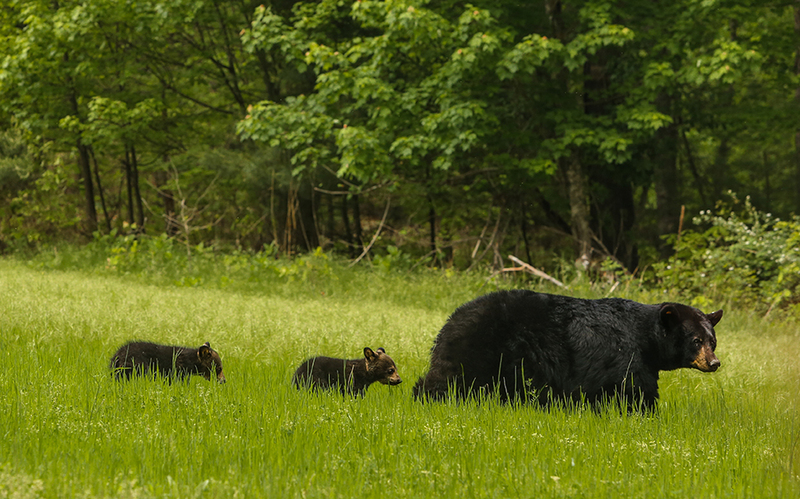 Last year the park began using GPS collars to track its bears as part of a larger study with the University of Tennessee, the Tennessee Wildlife Resources Agency and the U.S. Geographical Survey (USGS). In the first year of a three-year study, the park placed GPS collars on about a dozen bears. All but two left the park, particularly in the Weir’s Valley area. Being able to track bears’ paths outside the park has allowed Smokies officials to take a more proactive approach, working with those private business and homeowners to crack down on problem spots. 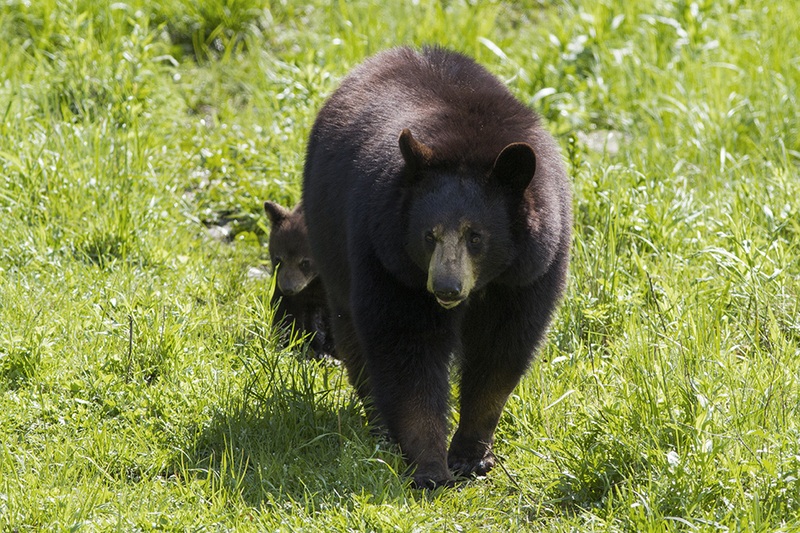 It’s just the latest change for an ever-evolving bear management policy in the Smokies. Quite a bit has changed since 1952, when the park prosecuted Cataloochee Ranch owner Tom Alexander for rounding up a posse, tracking and killing a bear that had apparently killed one of his heifers. In a preview of the late 20th century’s Sagebrush Rebellion and last year’s takeover of the Malheur National Wildlife Refuge in Oregon, the prosecution of Alexander sparked a reactionary movement that rallied to his defense. After the jury hung twice, it ultimately acquitted him. Another story, dating from the days when rangers placed choice trash tidbits on stone tables at the park dump for bears to eat in front of gawking tourists, has one father painting honey on his daughter’s cheek in hopes of getting a photo of a bear licking her. Park officials have worked hard to put distance between bears and visitors. 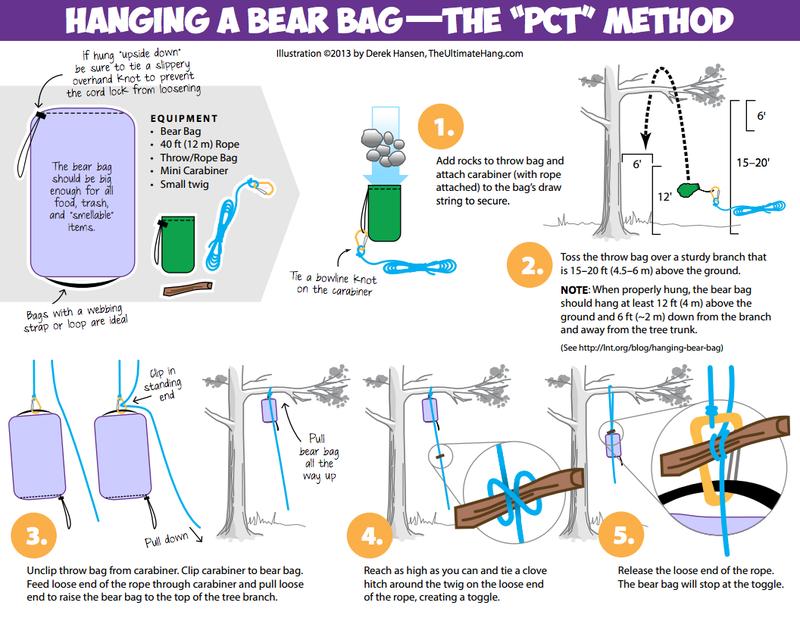 The Smokies began to educate campers and backpackers about food storage. About 25 years ago, the park replaced its 32-gallon trash cans with larger, bear-proof dumpsters to accommodate the massive amounts of trash its visitors bring—120 tons in July alone. It shifted management of its picnic areas, closing them earlier in the evenings and assigning facility staff to work later so that they can clean up those areas and ensure no food or garbage is available to bears exploring in the overnight. In the late ’90s, the park also placed food storage cables at backcountry sites to provide a more reliable way to keep food from bears. In the last decade, it’s enforced a regulation forbidding visitors of willfully approaching elk or bear within 50 yards. Unfortunately, the advent of smartphones and social media has set back efforts. Bear jams still occur regularly at Laurel Falls and in Cades Cove, two of the park’s most highly trafficked areas. Stiver says that one of his volunteers saw a woman actually reach out and try to pet a bear in 2015, and omnipresent phones have made a mess of management efforts. The problems usually build slowly: A bear appears, and then over a period of hours or days slowly moves closer to the road as tourists drop food from their vehicles. Eventually, the bear approaches a vehicle, and park officials must intervene. Bears that appear in picnic areas and campgrounds in search of food are captured, tagged, and released—an approach that works about 60 percent of the time, Stiver says. More aggressive bears are moved. Rarely, the park must euthanize a bear. That happens when a bear attacks someone, as happened with Gabe Alexander last June. In that case, officials shot one bear and euthanized another bear at nearby campsites in the days following the incident. Two other attacks occurred in 2015, in Virginia and New Jersey, the latter resulting in a person’s death. Just last month, a bear in the Great Smokies bit a thru-hiker camped in Spence Field through his tent. He survived the attack and was able to scare away the bear. Most run-ins between bears and people don’t end with death, of a person or a bear. 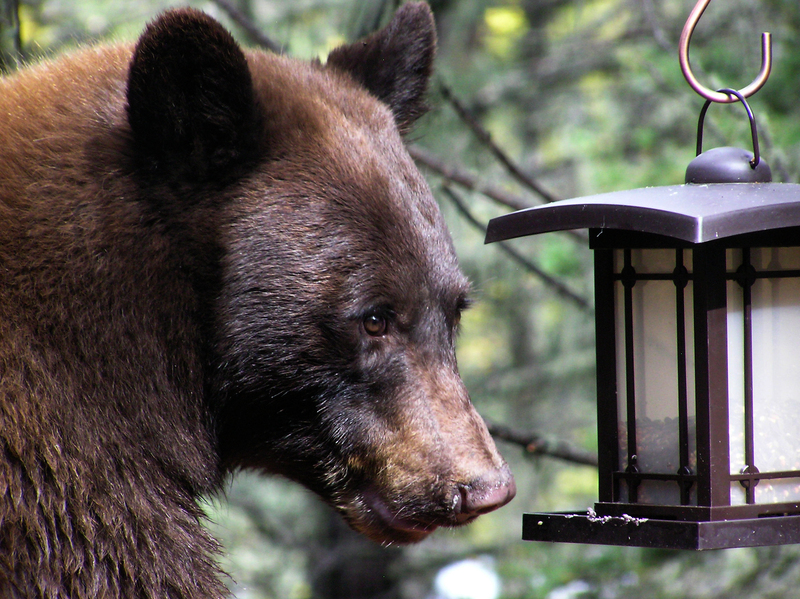 Virginia wildlife officials operate a bear help hotline, and each spring they see a regular uptick in calls as bears emerge from hibernation and hit bird feeders and trash cans. Callers are linked to professions with the U.S. Department of Agriculture’s Wildlife Services. The first round of advice is almost always the same: Secure your trash, take down your bird feeder, and harass the bear until it leaves. Nine times out of 10, that takes care of the problem, says Dan Lovelace, Virginia DGIF district wildlife biologist. 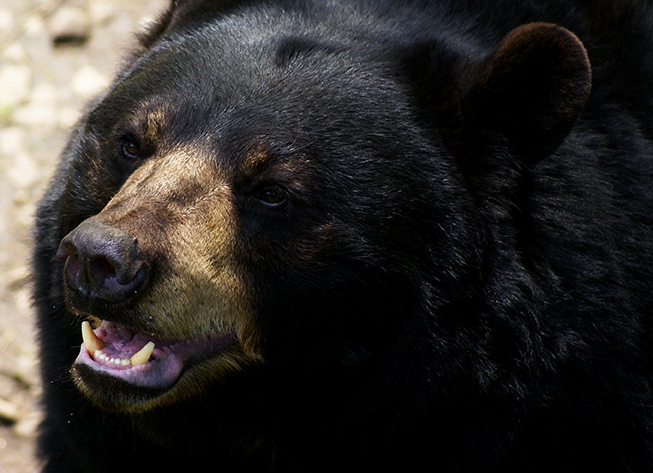 Lovelace plays a crucial role in giving public presentations about bears and other wildlife each year, including recently at Soaring Ridge Brewery in Roanoke. The agency’s response varies on the details of each situation. If the bear is in an urban area with little nearby habitat, officials will capture and relocate it, although that tends to be a solution of last resort. If it’s caused agricultural damage, ruining a corn crop or killing livestock, the DGIF may issue a kill permit to allow a farmer to shoot the problem animal. Occasionally, Lovelace sees something new. For the most part, though, Lovelace’s advice is simple: Secure potential food sources, and don’t let the bear get comfortable. Convincing people to follow the latter bit can be more complicated that it seems: People like to see bears and will let a bear linger as they take pictures and enjoy watching it. Allowing a bear to settle in, however, may lead to an escalating problem that turns tragic. David and Agatha Grimsley had seen the bear before, watching with wonder as it slowly make its way up from the banks of the Little River, past their pig pen and alongside an electric fence before turning away 20 feet from their front porch. They also saw signs the bear had been around their livestock, raiding pig scraps and 100-pound grain bags from their chicken yard without touching the birds. Then, in early summer, their perception of the bear changed forever when David went out for morning chores. Normally, he’d have sent his 6-year-old son Otis to bottle-feed their calf Iris, since he had been the one to nurse her back to life on the night she was born. They’d planned for Iris to be Otis’ first milk cow, so he took special care of her. Afterward, the Grimsleys realized the bear had likely killed the calf not for her meat, but to cultivate maggots that would appear for days afterward. Agatha found herself struck by the irony that, like them, the bear was farming. Agatha posted on Facebook about the experience, citing “the trials and tribulations of everyday farm life,” from losing beds of squash to chickens, to hearing chickens pulled through coop wire at night. The Grimsleys held an informal funeral for their calf. They poured milk over her from the bottle that they’d intended to feed her that morning, and Otis sprinkled pressed four-leaf clovers he’d saved over her body. They all talked about Iris, and then said farewell. Killing a bear for taking livestock requires a state kill permit, which allows the use of meat but not any of the trophy parts, including the hide. The law is intended to discourage poaching via kill permit, but it felt wasteful and discouraging to the Grimsleys. Soon after finding the dead calf, David had one near-miss with the bear, but as time passed they didn’t see her anymore. Agatha says that as the weeks and months went by, they came to think about the incident from the bear’s perspective. “We realized why it had all happened was that she’d just had her cubs,” Agatha says. An epilogue: Some months later, the Grimsley’s daughter fell and needed to go to the hospital. David realized he’d forgotten his phone and drove back to the house. As he was returning out to U.S. 221, he saw the bear and her cubs splashing in the Little River next to the road. David experienced it as a spiritual moment. Was the appearance of the bear and her cubs during a moment of family emergency a coincidence? Or was it one of those cosmic puns, a moment in which the underlying interconnectedness gets illustrated in a personal way? Either way, the Grimsleys say they’re glad David didn’t shoot the bear.